Central Florida is trying to follow up on its undefeated season with a new coach, a new defensive cornerstone and the same old high expectations. UCF lost its coach when the lure of his alma mater prompted Scott Frost to return to Nebraska , though he stuck around long enough to coach the Knights in a Peach Bowl victory over Auburn . 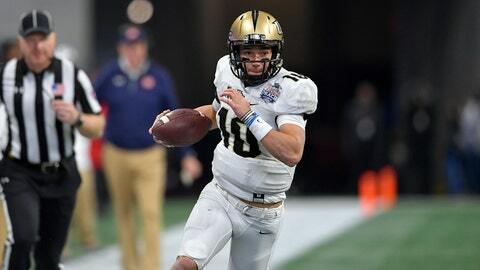 The Knights also must replace American Athletic Conference defensive player of the year Shaquem Griffin, who was drafted by the Seattle Seahawks in the fifth round. Notes: MWC preseason offensive player of the year Brett Rypien has thrown for 9,876 yards, the highest total of any active Football Bowl Subdivision player. The Broncos also return Alexander Mattison, who ran for 1,086 yards and 12 touchdowns last season as Boise State went 11-3 with an MWC title and a Las Vegas Bowl victory over Oregon . Boise State beat Fresno State in last season’s MWC championship game, and those two teams figure to face off for the title again this year. Notes: Lane Kiffin orchestrated a remarkable turnaround at Florida Atlantic last season. FAU went from 3-9 in 2016 to 11-3 in 2017 and closed the year on a 10-game winning streak that included a Conference USA title and Boca Raton Bowl victory . Florida Atlantic has Conference USA’s preseason offensive player of the year (running back Devin Singletary) and defensive player of the year (linebacker Azeez Al-Shaair). The schedule includes trips to Oklahoma and UCF. Notes: We’ve included two teams from the American, which has emerged as the strongest of the Group of Five leagues. Memphis loses star quarterback Riley Ferguson and receiver Anthony Miller from a team that went 10-3 last season , but Darrell Henderson is back after rushing for 1,154 yards and nine touchdowns a year ago. The Tigers figure to battle Houston and Navy for the West Division title. Memphis has only one game against a Power Five opponent, an Oct. 20 trip to Missouri. Notes: Although Ohio has reached a bowl game eight of the last nine seasons, the Bobcats haven’t won a MAC title since 1968 . This could be the year. Ohio went 9-4 and won the Bahamas Bowl last year with an offense that averaged 37.4 points. Quarterback Nathan Rourke rushed for 21 touchdowns last season, while running back A.J. Ouellette ran for over 1,000 yards. Ohio and Northern Illinois look like the MAC’s top teams.